Several identical reliefs were found bedecking walls in Persepolis, ancient Iran, emphasising the importance of this image. This lion hunt scene represents not just a natural act of hunter and prey, but also the changing of the seasons with the sun-linked lion devouring the moon-associated bull. 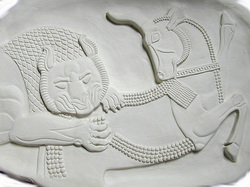 The life and death struggle between the lion and bull continues to be a strong image within Zoroastrian mysticism and is celebrated yearly in the Nowruz festival. Countless images of the sun-god Anu in his solar chariot exist, many showing the Father of the Gods holding a bow, perhaps in acknowledgement as his role as judge and protector. 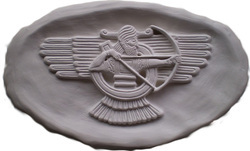 The winged sun is an image that is shared by both Mesopotamia and Egypt, in both countries symbolising power, royalty and continuance. This image has been found from the walls of temples and palaces to carved on personal amulets, such was the appeal of the god's blessing. 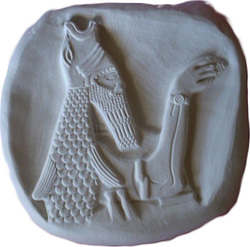 The deity shown here is Enki (or possibly a personification of him), sometimes called Ea, who was one of the most benevolent of the Mesopotamian pantheon. Often he is shown lifting an object to the lips of a human, possibly a fruit from the mesu-tree which was thought to impart long life.